Anyone who’s tried, knows. Sitting down to talk about money can be stressful. Whether it’s a spouse, a child, a dependent parent, or even a roommate, our lives –and our money– are interwoven with those around us, and with that comes conflict. We enter conversations about money with the best of intentions, but often leave frustrated or even resentful. For Jason and Ammy, this was nothing new. Since the beginning of their marriage they had tried to bring their finances together, but with their different views on money it was hard to find common ground. Jason: I would pay all the bills at the end of the month. I’d look at our income, and pay it all out, and try to make sure we had enough. Ammy: I don’t like limitations, I never had to set a budget before and I didn’t like it. It was humbling. It felt like saying ‘no’ to a lot of things. Don’t Argue About Your Spending. . .
Ammy: I learned that things add up really fast. All the little things, it was kind of an eye opener. Jason: Like spending 300 a month, each, for breakfast and lunch. But a lot of that is the convenience factor. Ammy: We’re working all day. We’re up at 6 making meals, then we’re working, then the kids come home, it never ends. Without Goodbudget, Jason and Ammy would have just seen 600 dollars on their bills for eating out. Without more information, that just leads to a vague argument about how much they’re spending. With Goodbudget, Jason and Ammy were able to realize that those 600 dollars came from eating breakfast and lunch out as a result of their busy schedules. This lets Jason and Ammy have a conversation about how much they choose to spend. Maybe they’ll decide that the money is well worth the added sanity to their mornings. The next time they see 600 dollars on their bills, they won’t have to feel guilty or fight about it, they’ll know where that money is going and why they chose to spend it. Or they might decide to cut back on their spending and carve out the time to prepare their own meals and lunches. This might mean making bigger dinners to use for lunch the next day, or simplifying their meals. Whatever they decide, it’ll be their choice. 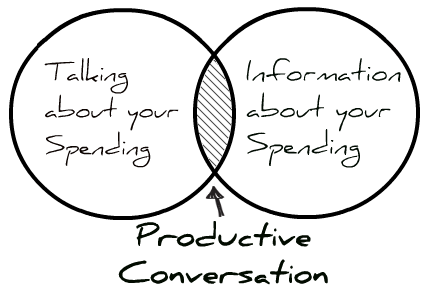 Instead of arguing about their spending, they’ll have made a choice about how they want to spend their money. Ammy: Tithe the full amount at church. Do things with the kids, lessons and activities. Go on vacations. Jason: To Hawaii, and not San Diego again! Ammy: To go to Hawaii, yes.